When it comes to audio-cutting, you may firstly consider some free or online audio cutter software. It is undeniable that there are various many types of audio trimmers in market, for example, MP3 cutter, M4A cutter, WAV cutter and more. 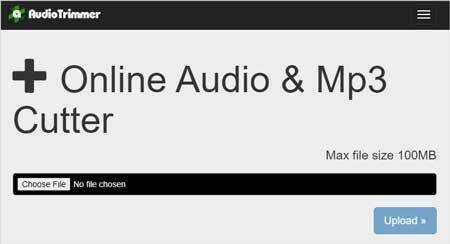 If you still struggle to find a suitable one, you might as well have a look at the following 5 online audio cutters. Powerful as Aconvert Audio Cutter is, it is able to cut any audio files with ease, such as MP3, WAV, OGG, AAC, M4A, FLAC, AIFF, etc. 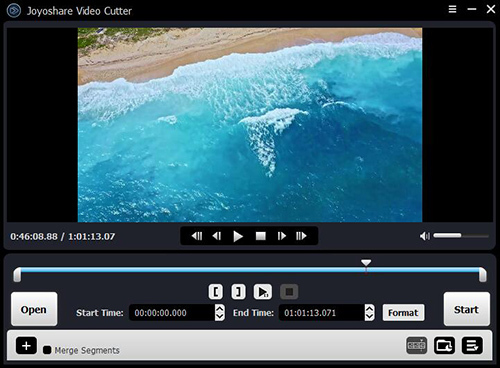 With this audio cutter software, you can either choose files from your local hard drive or input a detailed audio URL to its designated frame. Only by setting exact audio start position and duration, you can finish the essential step. Then what you have to do is to simply click the "Submit" button. There is no decoding process once this intelligent tool starts to cut the audio parts you select. After it stops its working process, you can press the "download" icon to get a file QR or store destination audio on your online storage services, like Dropbox or Google Drive. However, it only allows you to import audio file to edit with the max size limit of 24MB. Acting as an online cutting app, Audio Cutter Pro is good at trimming any audio tracks in your browser. It has powerful capability to deal with multiple audio sections simultaneously. Coming with well-arranged waveform zooming, it delivers an excellent platform for you to split any audio tracks in precise way. To handle long tracks, Audio Cutter Pro can also come in handy. With multiple intervals support, this tool can leave out different portions of a long audio file. Alternatively, it is available to support over 300 formats, let you create iPhone ringtones and add fade-in or fade-out, etc. Once the cutting process is done, all audio files will be deleted automatically a few hours later. As a web-based audio editing program, TwistedWave has access to process and edit your audio files without requiring you to download other third-party software. It provides any user with up to 5 minutes free trail on mono file. Moreover, aside from web version, it also includes full supports to diverse platforms, such as Windows, Mac, iPhone and iPad. 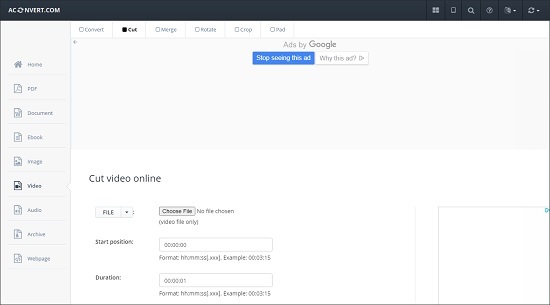 This tool enables you to upload audio files not only from local folder, but also from Google Drive and SoundCloud. It as well permits you to add effects on your audio, for instance, fade in, fade out, speed-changing, bitrate-adjusting, etc. More amazing, TwistedWave can let you grab microphone sound so that you can add narration to your audio file. 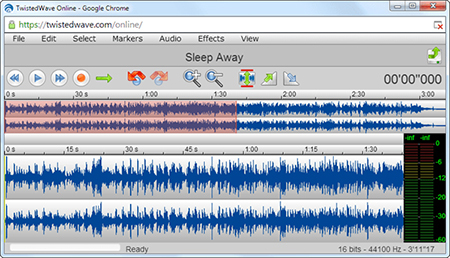 Audio Trimmer is fairly an easy-to-operate audio cutter application. It is capable of splitting your audio files on the fly. Supposing you are looking for handy cropping software, you can take it into your consideration. This tool is unable to support a large wide of audio formats, but most of common audio formats can be accepted, like MP3, WAV, WMA, OGG, M4A, etc. Under the help of it, you are empowered to change audio bitrate, reverse audio file, add fade-in/fade-out effect, etc. In addition, this trimming program can be compatible well with tablets or mobile phones. One of its short comings is that it can only support audio file with up to 100MB size. Once it excesses this limit, you cannot process your audio file. 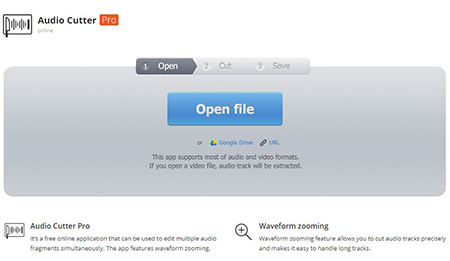 With a clean and user-friendly interface, Hya-Wave makes shortening audio file easy. It entitles you to copy, paste, cut, crop and clear your audio track. Even though it requires no extra extension installation, you first have to sign up for an account to save your edited file. It will assist you to save destination audio track on your online account. Then you can share it to other social media, like Facebook, Twitter, Google+, or directly download it to your PC locally. There are marvelous features developed, which consists of "Allpass Filter", "Amplify", "Bandpass Filter" and "Bit Crusher". To a large extent, the above top-ranked 5 best online audio cutter can facilitate you to cut audio files online straightly. Regardless of the limited features and privacy safety, they are easy to handle, especially when you are in urgent. Nevertheless, in case you are dissatisfied with this web-based solution, here an offline workaround, called Joyoshare Audio Cutter, is kindly recommended for your reference. It can do well in trimming any audio tracks to small segments with lossless quality at up to 60X faster speed. You will have no problem in producing it to other formats or devices. Comprehensively, this brilliant program can extract audio from video in smart way and join different fragments into a new one. Equipped with timeline and controller, it also make you decide cutting selection accurately. Note: According to your preferences, you can select either online or offline audio clipper to help you. What is notable is that you should try it in advance as the information we give is not exhaustive enough.